These cookies are a cinch to put together. I love recipes that look like this: a couple of bowls of ingredients to be mixed together. On the left, we have the dry ingredients - flour, cocoa powder, and baking soda. On the left, there's brown sugar, granulated sugar, egg, vanilla, salt, and of course, molasses. After mixing the two together, set the dough in the fridge to firm up. This doesn't take much time - half an hour is enough if you're pressed for time. Like me, make the dough, set it in the fridge, and just grab it when you're ready for cookies. You can bake these cookies to whatever size you like. I went slightly smaller than the recipe intended but still scooped good size mounds (2-3 tablespoons of dough) that I rolled in sugar. As I mentioned, granulated sugar gives the cookies a subtle shine, more noticeable around the edges after baking. Turbinado sugar is coarse and gives you plenty of crunch while the sanding sugar is probably the one I associate most with Christmas cookies and is a nice medium ground between the two. Before baking, press the dough balls down gently until they're about 3/4 inch thick. In a 375 degree oven, bake the cookies for only 7-8 minutes until they puff slightly and are beginning to crack. For soft cookies with a slightly more dense/chewy center, take the cookies out of the oven and give the baking sheets a hard tap onto your countertop and lightly press the center of each cookie. They will cool and firm up but be plenty soft and delicious. Preheat oven to 375 degrees with racks positioned in the upper and lower thirds. Line 2 baking sheets with parchment paper or silicon baking mats. In a large bowl, whisk the melted butter, brown sugar, granulated sugar, and salt together. Whisk in the egg, vanilla, and molasses. In a medium bowl, whisk together the flour, cocoa powder, and baking soda. Add the dry ingredients into the wet and whisk until just combined. Cover the cookie dough and chill until firm, about 20-30. Place 1/2 cup of sugar into a bowl. Scoop cookie dough into about 2-3 tablespoon balls. Roll balls in the sugar and place onto the baking sheets, spaced about 2 inches apart. Lightly press down on the cookie dough balls to about a 3/4 inch thickness. Bake (rotating pans midway) until cookies are puffed and just beginning to crack, about 7-8 minutes. Remove cookie sheets from the oven and give the baking sheets a firm tap onto the countertop. Gently press down on the center of each cookie to deflate (this helps make the center more dense and chewy). Let cookies cool about 2 minutes on the baking sheets, then remove to a cooling rack to cool completely. I love molasses cookies. These are a must for the holiday cookie platter. These look fantastic, Monica. I think these cookies would make most people feel happier! Kitchen remodeling can be stressful (and rarely convenient) no matter how small the kitchen. So many decisions! It will be exciting when the job is finished though, and you have a beautiful updated kitchen! I haven't baked much with molasses and this recipe might be a great way to change that! I love the holiday season and anything molasses (or really any cookies that I see at this time of year) gets me soooo hype for Christmas baking :) These look delicious! Holiday cookies are the best way to start holiday baking. I love molasses, and these cookies look and sound wonderful, Monica. I will have to give it a go sometime soon. I love molasses cookies. The idea of adding chocolate is a great one! It puts me in the mind of Christmas, too. Cocoa powder can be transforming! : ) Thanks, Beth. my grandmother used to make a cookie that was similar to these, they were one of my favorites growing up, thanks for the recipe, will surprise my sister. Take care Monica! That sounds wonderful - the cookies your grandmother used to make and the thought that you might surprise your sister with a batch. Thanks so much, Cheri. I can never resist soft and chewy cookies! Good luck with the reno whenever you guys go ahead with it! Early holiday baking sounds like a great plan! These look SO incredible and I am SO craving a batch of right now! You are so sweet, Kelly. Thanks for the kind words. Making cookies is always such a fun thing, isn't it? Hope all is well and you have a great week! Soft and chewy molasses cookies are my absolute favorite! Hands down, my favorite cookie. I could probably polish off this whole batch for you in no time flat. Your kids are so lucky! Did you use dark or light molasses for these cookies? Do you remember my little dilemma living in HK and not being able to find light molasses for our gingerbread cookies? I love molasses cookies. These look so perfect and delicious! These look delicious! 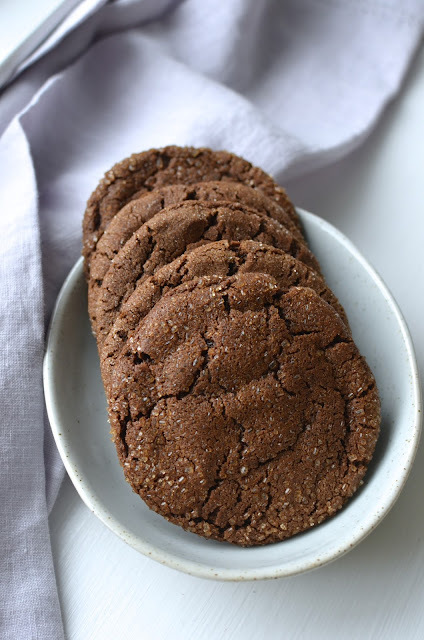 I’m a big fan of molasses cookies so I’m sure chocolate molasses would be even more amazing! Hi Bal! Thanks...they were very soft and I liked the crunch on the outside...a nice way to enjoy a chocolate cookie that isn't too rich and has a bit of spice behind it. Oh I love everything about these cookie Monica! It's never too early to start baking for the holidays when you're a food blogger :) The substantial size of these cookies is perfect. I've never tried chocolate and molasses before but I love both so I think it's a given that I will. Have a great week! Thanks so much, Tricia. I usually make smaller cookies but lately, I've got the urge to go big like the "commercial" ones. The textural difference between the edges and center is nice. I know you'll have some amazing holiday treats for us soon and I'm looking forward to it!